Lennyloveslife – Page 3 – "If you do what you need, you’re surviving. If you do what you want, you’re living." July 31, 2017 July 31, 2017 by lennyloveslifeLeave a Comment on Lenny loves…brunch! Brunch, that lovely meal between breakfast and lunch that can be dragged out to last a considerable amount of hours and apparently the fastest growing food trend in the UK at the moment! Me and my friend Hannah took ourselves off to canEAT in Stirchley to check out this much talked about café situated on the Pershore Road not too far from Loaf. The first thing you notice about this casual eatery is how lively it is. It is fairly small in size, so gets quite busy but we managed to grab a table right by the counter. There are also smaller tables for kids to hang out along with a selection of toys and books to keep them occupied. We even witnessed two little girls having an early afternoon tea session with scones and juice! Although the menu is small in choice it certainly didn’t lack in enticing options and I could have easily eaten everything on there. 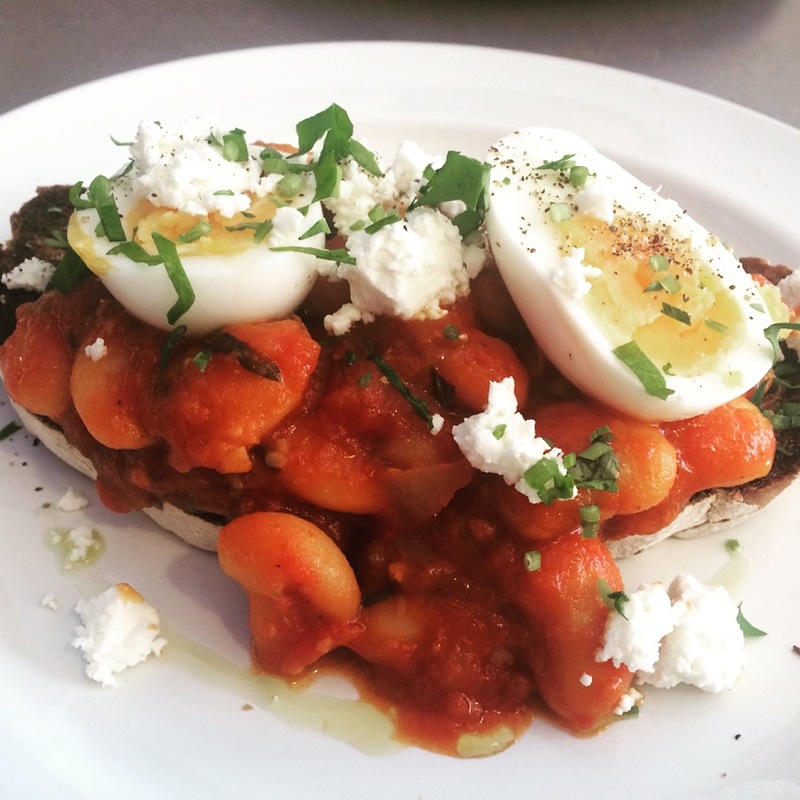 It was a tough decision to make, but myself and my friend both went for the Giant Beans, Egg and Feta on toast. 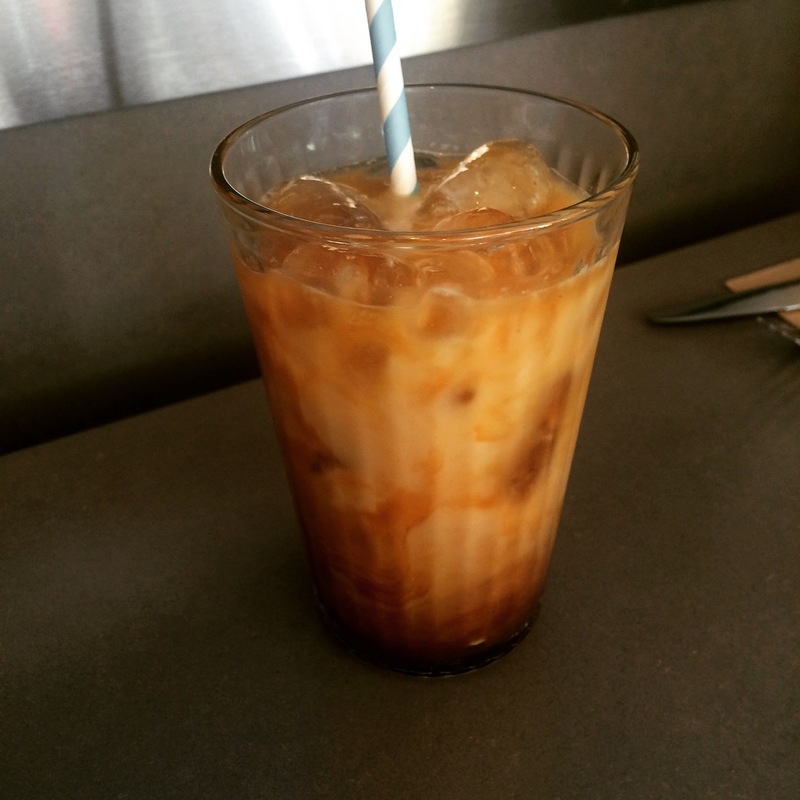 I also went for the Vietnamese Coconut Coffee (Cold) which featured on the menu that day. The coffees came first and my Coconut Coffee, after a quick stir, was just what I needed after the walk down to Stirchley. The coffee was made with Coconut milk which was great as usually most coconut coffee options are made with coconut water, which despite being massively good for you, I cannot stand! Up next was the food. Our jazzed up beans on toast looked fantastic on the plate, I just hoped it tasted as good as it looked. It didn’t disappoint. There was a lovely tang to the sauce that the giant beans were cooked in and the beans still had a bit of a bite to them and weren’t all soggy and mushy. The soft boiled egg that perched on top of the beans like an orange jewelled crown gave the sauce a bit more creaminess and the feta, whilst there wasn’t a lot on the plate, it was the perfect amount not to overpower and just give it that something extra. We were both pretty full after that, however, I couldn’t resist ordering myself a little dessert, as who said you can’t have dessert at brunch?! 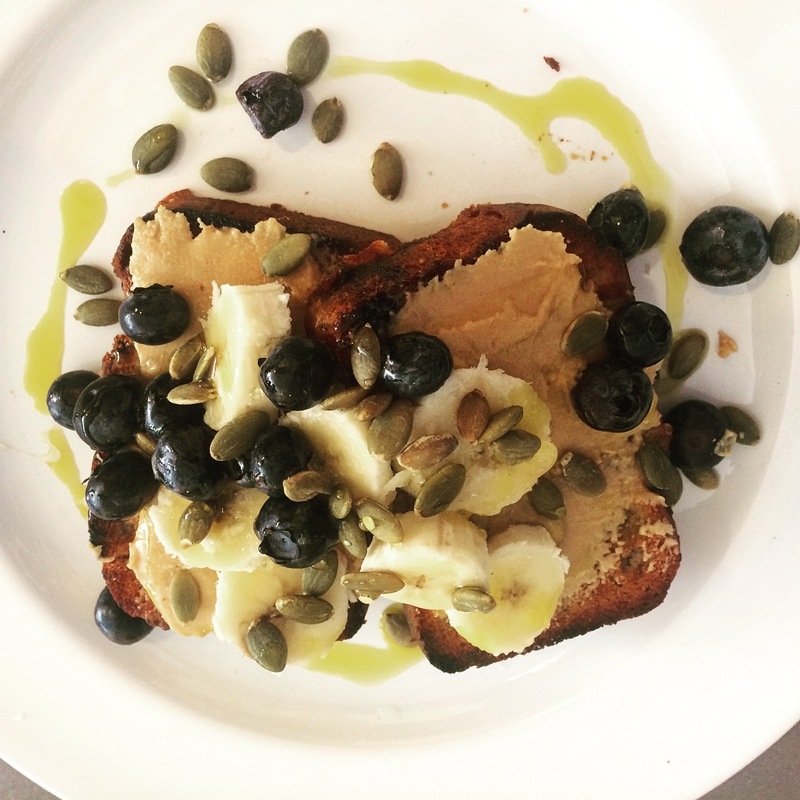 I went for the warm banana bread, peanut butter and blueberries as I have a soft spot for anything with peanut butter. It looked stunning on the plate, but it didn’t stay that way for long as it was soon completely demolished. The banana bread was moist but crumbly with a thin layer of peanut butter so it didn’t take away from the flavours of the bread along with little bursts of blueberries along the way, and of course another coffee to help it down. Although the café was busy and lively, it was still quiet enough to chat and hear yourself think and at no point did we feel rushed to vacate, with the table next to us looking like there were set for the day there. This lovely small, but perfectly formed offering in the heart of what is fast becoming the up and coming area to be seen in South Birmingham, is certainly a hit with the community and I will be keeping my eyes open for bigger things from them. And I mustn’t forget to mention Isherwood Florists who are right next door to CANeat. 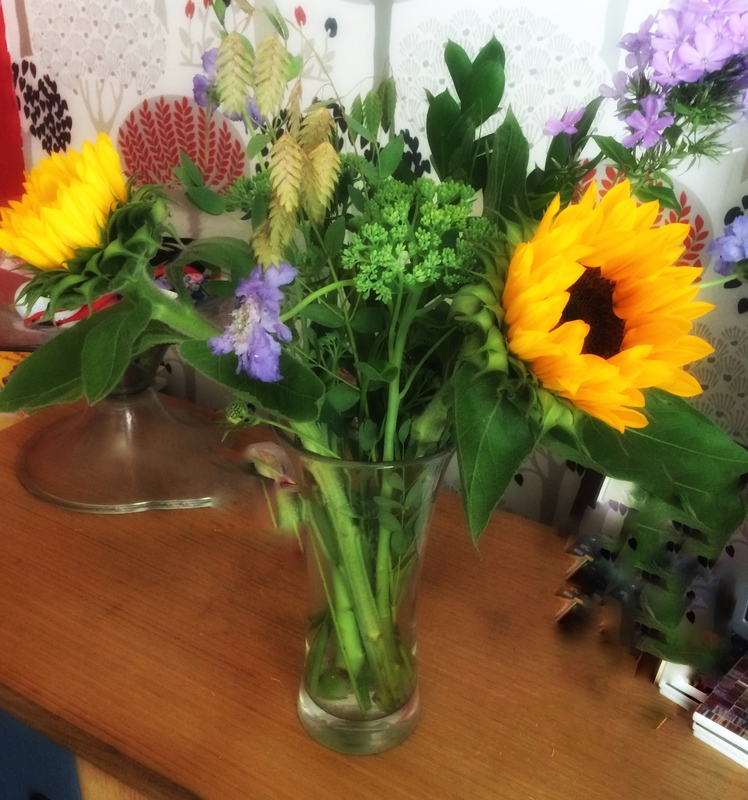 A lovely little florist with what I can only describe as selling beautiful natural fresh flowers. Brunch and flowers on a Saturday what more could a girl want! A very long time! 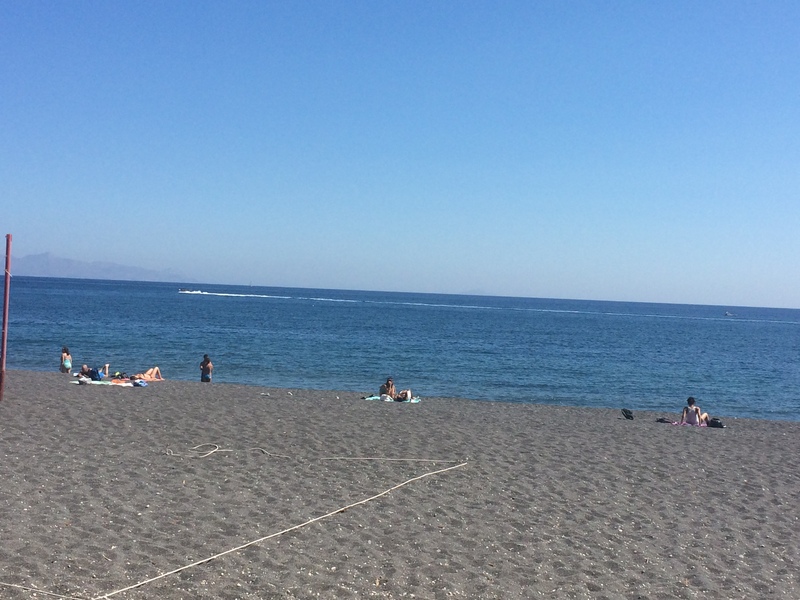 In fact nearly 6 months since I last blogged!! No apologises are necessary here. Life has simply been challenging for me over the last 6 months, and blogging has not even crossed my mind. I hadn’t really planned on when I was going to return to blogging, but this evening after a lovely weekend I had the urge so thought I would take advantage. First on my list to update you on is I’m still not in my new flat (boo!) but I should be all moved by early July (Yay!) fingers crossed! I am getting really excited and a bit antsy to get in there and start putting my stamp on the small space (no joke!) I will have. It’s kinda weird to not have to ask someone their opinion on furniture and decor or to have to listen to their opinion. If I want a bright yellow sofa or a teal sofa I can have it (although I am probably going to go for grey!). No doubt when I get down to buying the serious stuff and moving in I shall bring you along with me. Secondly, I have spent a lot more time at home since November where as before I was staying at a ‘friends’ house most of the time. That ‘friendship’ as turned slightly sour but these things happen. I have mostly enjoyed being back at home, I kinda think that this time round I’ve been a bit calmer and the knowledge that soon I will have my own space has made it a lot easier to bear, although it still has it’s moments. Thirdly, work has been great! I have really found my place at work and doing really well. Although it has been hectic at times and no more so than the last few months but I have finally found somewhere that I can see myself staying and settling. Finally, I have met someone new. We met just before Christmas and we have taken things slow and steady. We get on so well and he makes me feel really good about myself so its looking really positive. I do hope that I feel the urge to blog again soon, as the next few months are going to be so exciting and it would be lovely to share it with you guys! Last week the lovely Vicky from Brumderland kindly invited me and a few other bloggers to the lovely 1847 restaurant located in the Great Western Arcade in Birmingham City Centre. 1847, the year that the vegetarian society was formed, is also the given name for this modern small chain of vegetarian restaurants located in Brighton, Bristol, Manchester and of course, Birmingham and was founded by Damien Davenport. 1847 Birmingham is a small place, but the decor compliments the space with a minimalist light and airy feel which is only emphasised by the lovely mezzanine level, which is where we were being hosted. 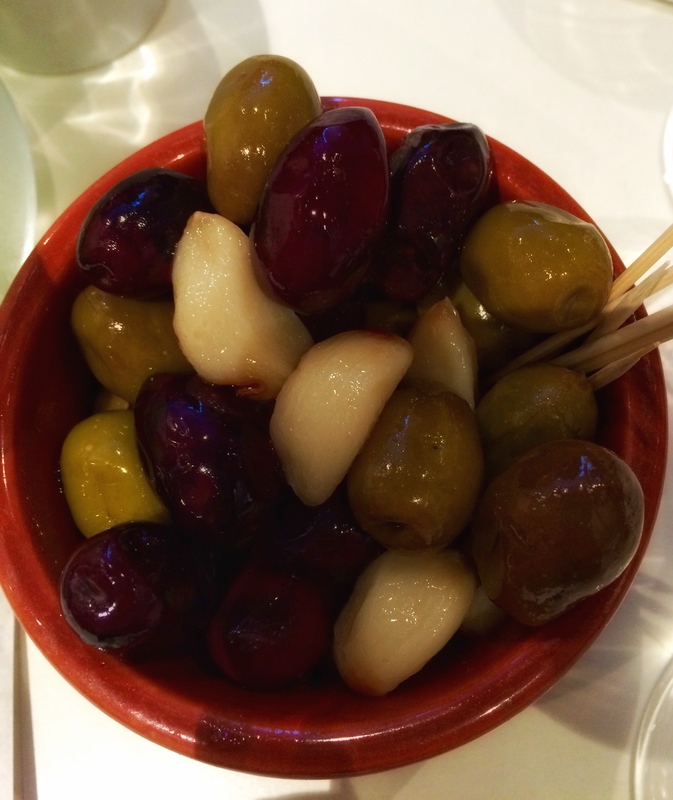 Welcomed by a glass of Prosecco and lovely smoked olives and garlic on the table, we all sat down and perused the specially formed menu which was put together by the chef just for us. This gave us a taste of the type of food featured on their a la carte menu. To get our taste buds going we were treated to a beautiful piece of focaccia bread with shakshuka hummus. 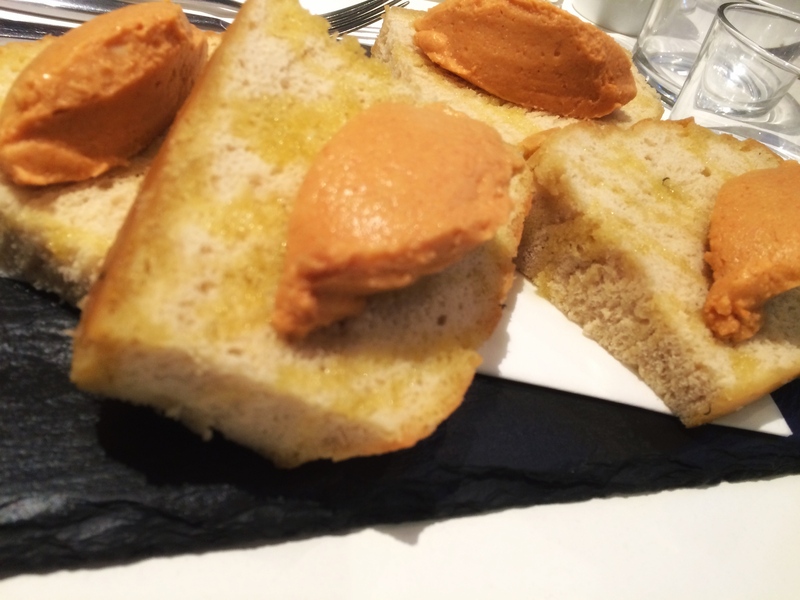 The bread, still warm from the oven, was delicious as was the hummus, lots of flavour and topped with the smoked garlic, perfect! As soon as we had finished the appetiser, the starters or ‘small plates’, started to arrive. They all looked pretty spectacular and I was getting some serious food envy, but once mine arrived I was pleased with my choice. 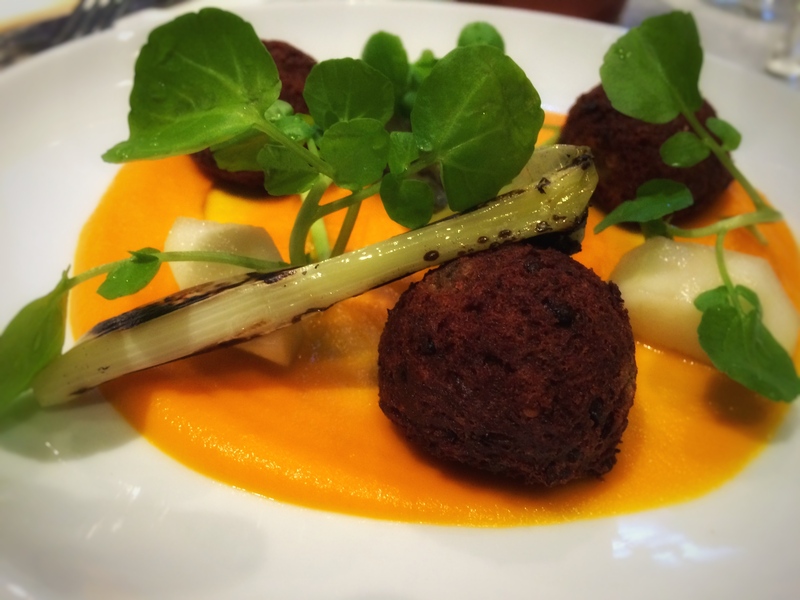 I decided to go for the Sage and lentil croquettes with carrot puree, pear and winter leaves. The dish was very colourful and the croquettes were delicately flavoured. Even as a small plate, this dish packed a punch and was just enough to kick things off with. During and in between each course, Vicky kindly kept filling up my wine glass with a lovely white Portuguese wine, Alandra Branco Alentejo. I am usually quite fussy with my white wine, but this was very good indeed and I would definitely choose this from the menu again. My main course of Pressed Potato Terrine, burnt aubergine puree, charred broccoli, braised quince with a red pepper jus arrived. There were a lot of components to this dish, but they all complemented each other really well. 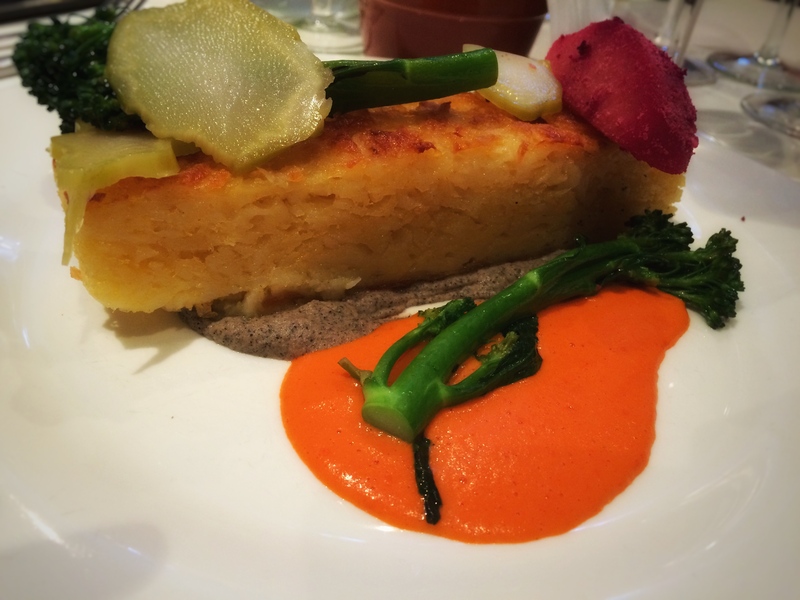 Everything on my plate was cooked to perfection, the potatoes weren’t stodgy and starchy, they were light and fluffy, the flavours and colours of the puree and jus were incredible and the presentation of the whole dish was outstanding (along with being gluten free and vegan). This, however, didn’t stop me from eyeing up the other dishes on offer! The choice of desserts was narrowed down for me between the chocolate brownie and the lemon yoghurt panna cotta, as the other choice was a coconut malabi with apple donuts, and unfortunately I am allergic to apple, big sigh! 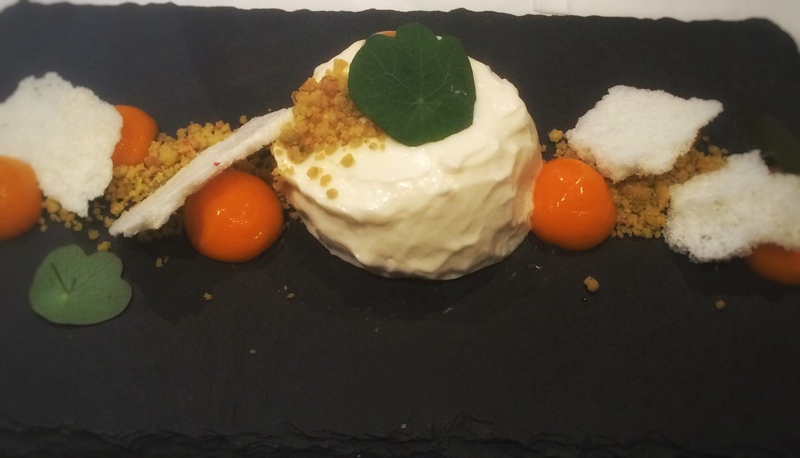 So I went with the lemon yoghurt panna cotta, which was beautifully light and zingy with the added sharpness from the accompanying buckthorn. I have had buckthorn once before at Carters in Moseley (check out that review here) and found it a really interesting flavour, one that went well with the lemon. I am very much of the opinion that whatever you ordered off this menu, you are going to be pretty darn pleased, although you will still be eyeing up everyone else’s choice! The dishes were beautifully presented and very instagramable, but the presentation didn’t distract from the amazing flavours, textures and taste of the dishes. Even though I am not vegetarian, I would strongly recommend anyone, meat eater or not, to give 1847 a try. The atmosphere was lovely and relaxed, and the staff were very friendly and knowledgeable about the ingredients in the dishes and the food was delicious, and, you certainly won’t miss your meat or fish. 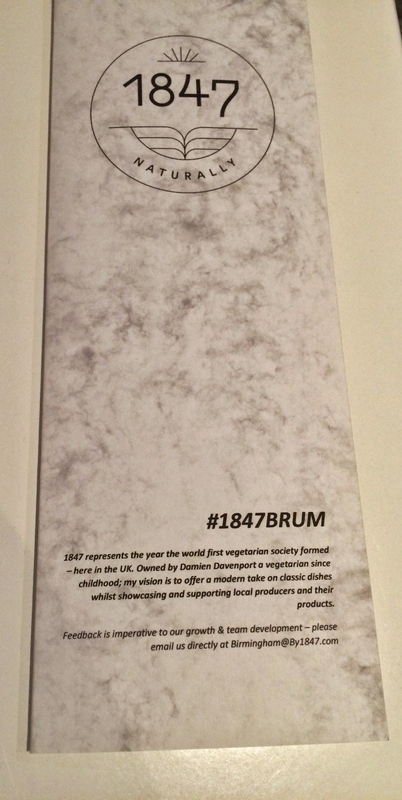 Have you been to try 1847 or can you recommend any other great vegetarian restaurants in Birmingham for me to try? OMG! I can’t believe I haven’t blogged since the end of July!! Although I have few excuses that is pretty bad even for me! A lot has happened in those few months, most of it good for a change!! And I thought it high time I updated you on my comings and goings. 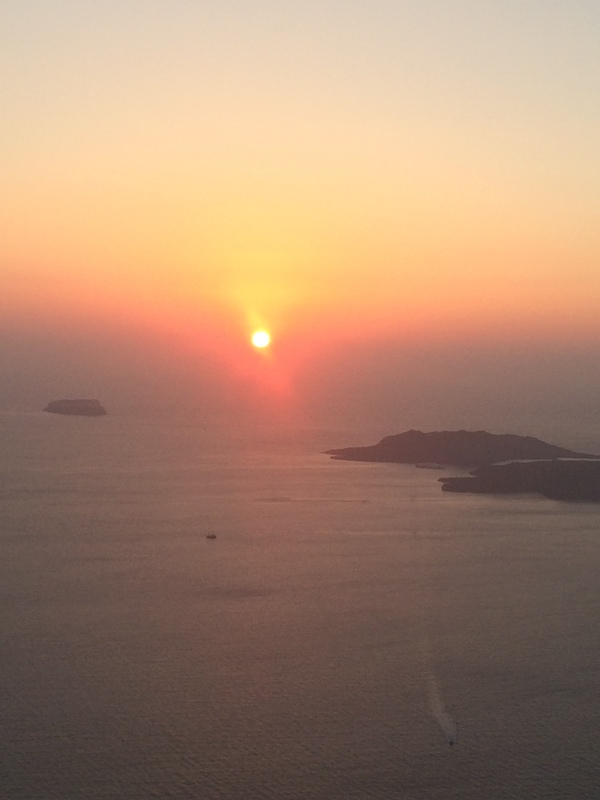 I have not long got back from a weeks holiday in Santorini, which I did through a company called Solo’s. It was a pretty amazing place, and there will definitely be a blog post soon! But the real update is that…wait for it… I am buying my own home!! It may only be a one bedroom apartment, but it will be all mine, well mine and the banks! This is a massive milestone for me and I am trying not to get too excited about it as I don’t want to jinx it, but so far it is all looking pretty good! It is a new build property, so I won’t be in the flat until at least March/April next year, but it is happening and I can’t wait! I have even started buying things already, as and when I see them, so it all doesn’t’ have to be done at once. You know me, any excuse to go shopping! I do want to try to do a series of house posts, regarding the actual process. I am quite luckily in that I did once own a flat a while ago and was there when my ex-husband brought his house. That, along with the fact I used to work in property law back in the day, puts me in a good position, so I thought it would be nice to share what happens in the process with you all, just in case it helps anyone. I am now hoping to go back to regular postings on here as I have missed it somewhat. However, I am not putting any pressure on myself cause that’s when I lose my passion for blogging! So hopefully you will hear from me again very soon! 5 weeks ago I turned the grand old age of 32! To celebrate me and my best friend headed off for a day of cocktails in Birmingham and then onto a meal at the Blue Piano, in Edgbaston. The cocktails were great but the part we are all interested in is the food. I decided to use this trip as the ‘C’ in my A-Z of food, as my main dish was Cambodian and my inspiration for going. Blue Piano is located in Edgbaston, behind the big Morrison’s at Five Ways Island and also happens to be opposite the very popular tapas restaurant, El Borracho de Oro. We had our table booked for 7.30pm and upon arrival were shown into the bar area. The reception area is like entering a bustling house and soon we were seated in the dining area with the menu in front of us. It was a hard task deciding what to go for starters, with a selection of Malaysian, Singaporean and Cambodia cuisine, it all sounded so tempting, and then they went and brought out the specials menu! 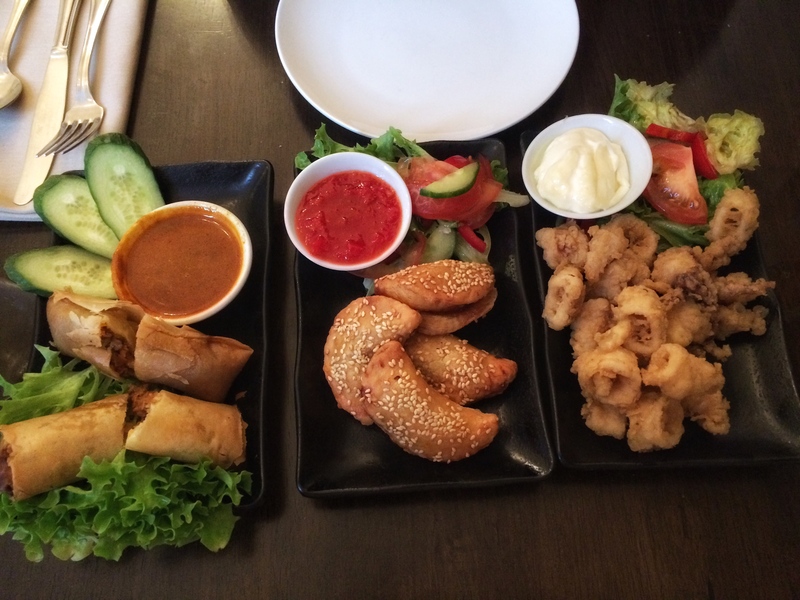 In the end we decided to go for a selection of three starters to share between us; beef curry spring rolls, roast pork puffs and deep fried squid. The beef curry spring rolls were off the specials board and came with a lovely curry flavoured dipping sauce. The rolls were piping hot, not too greasy and full of delicious tender beef filling. Next up we had the roast pork puffs, which were yummy bundles of honey roast pork wrapped in golden puff pastry. The pork filling was substantial and the puff pastry was nice and crispy with not a soggy bottom in sight. The deep fried squid was cooked to perfection, not chewy in the slightest and a lovely delicate coating of batter, served with a zingy lime mayo dip which was a really refreshing accompaniment to the squid. 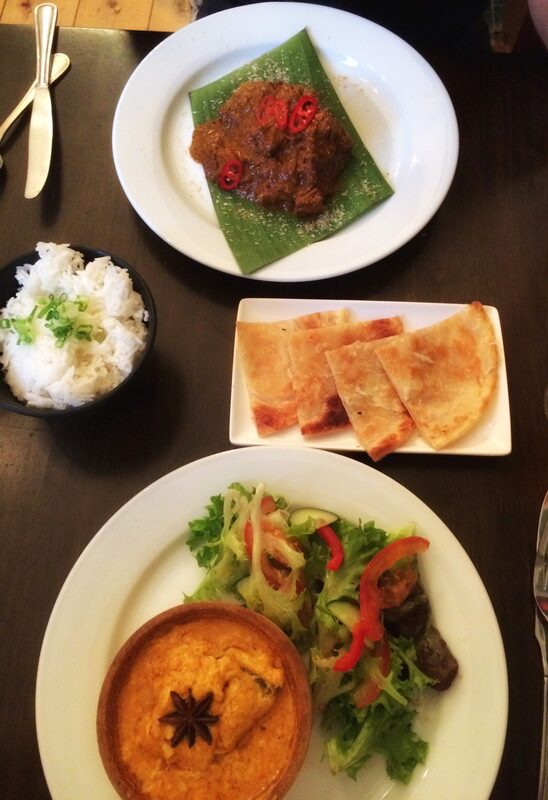 For mains, I had already decided what I was going to have as soon as I first discovered the menu at the Blue Piano, so for me it was the traditional Cambodian dish of Fish Amok Curry, and my friend went for the Malaysian dish of Beef Rendang. We opted for two sides, one of jasmine rice and the other some roti bread. My Fish Amok curry came served in a bamboo nest, again, quite traditional of how it is served in Cambodia. All I can say is WOW! It was just like being back there! The mild flavour and the creamy texture won me over instantly and the added rice complemented the dish well. There were big gorgeous pieces of fish in the curry and although I could’ve eaten more, it was probably the perfect size for a normal human being! 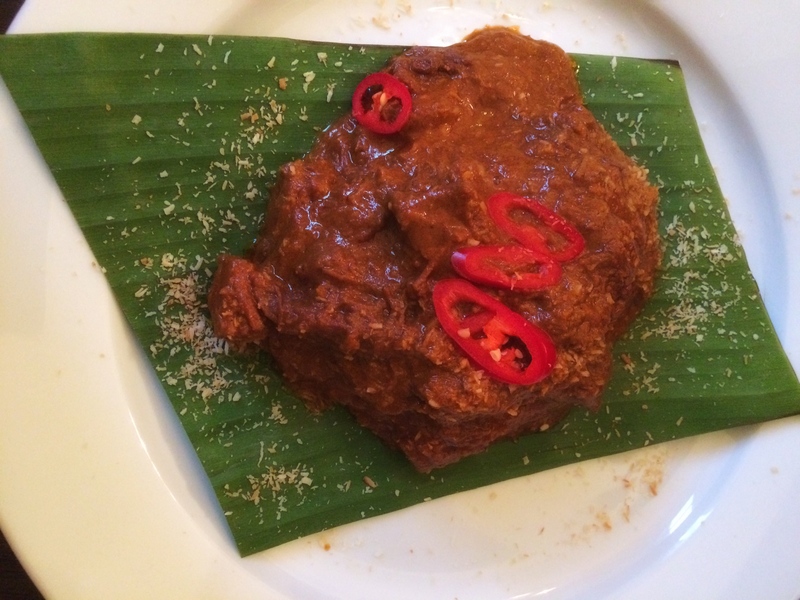 My friend’s Beef Rendang was where the spice was at! It was just a bit too spicy for my liking, but that aside, the beef, served on a banana leaf, was so tender and full of flavour, this was definitely a good choice if you like a bit of heat, but not too much that it blows your head off! The only thing that will blow you away will be the flavours in the dish. 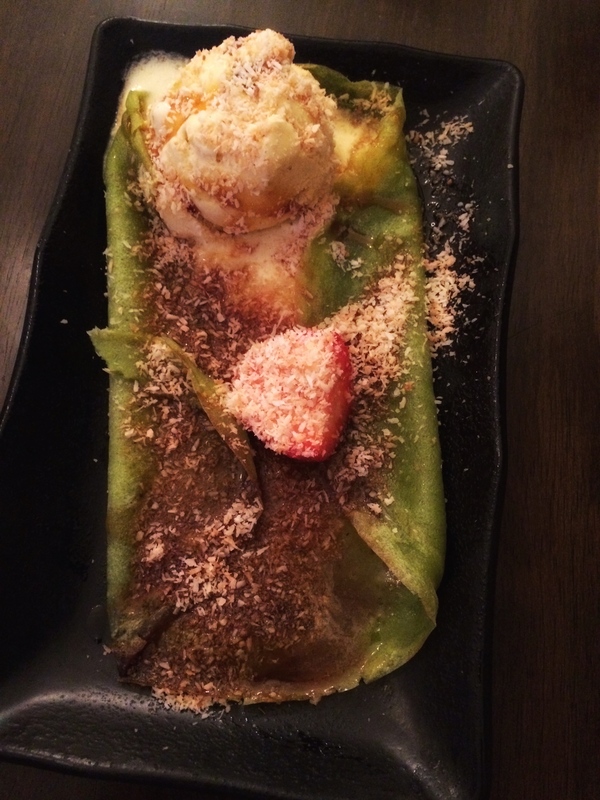 Although we were both quite full, I opted to have a traditional Indonesian desert of Pandan pancakes, which were filled with palm sugar and coconut. The green colour is from the leaves of the Pandan plant, but it doesn’t give the pancakes a particular taste or flavour, although the consistency of these pancakes is a lot stickier and gummy in texture! The palm sugar and coconut filling is very sweet, but the portion size was perfect so as not to put you in a sugar coma!! The service at Blue Piano was very efficient, despite them having a massive group party in at the same time and I will definitely be going back to try more of their dishes. 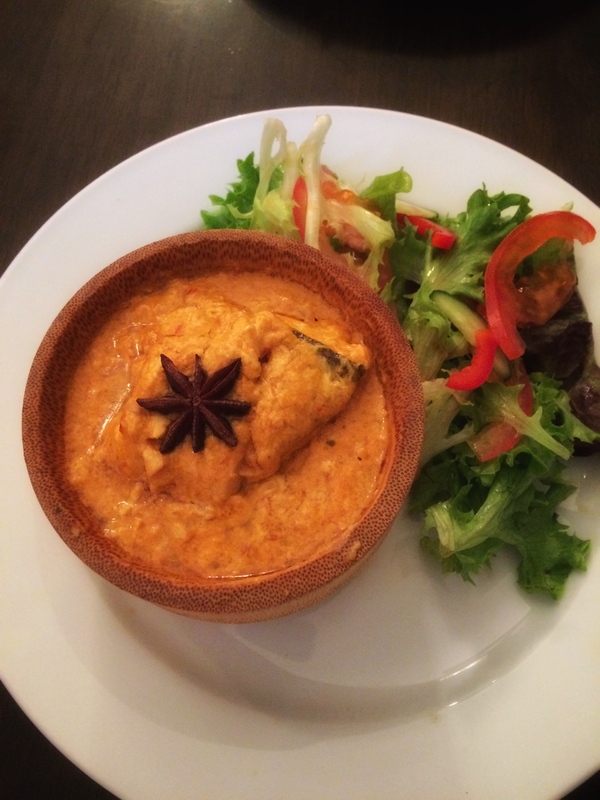 Next on my list is the Singaporean Carrot Cake and the Khmer Chicken Curry. I am also keen to try their sister venue in Kings Heath, Blue Ginger and would love to hear from you if you have been and what your favourite dishes on the menu were! July 2, 2016 by lennyloveslife2 Comments on Lenny loves…urm, IT issues??? So its been a while since I last blogged. Unfortunately, I have been having a few IT issues in that my memory is full on my computer and I haven’t been able to transfer photos across to upload them on to here. I have now brought an external hard drive so hopefully I can be up and running again soon. Along with life just getting in the way and a few changes in my situation things have been tough! I have so much to share with you, so initially it may be a bombardment of posts before I can get back to some sort of routine! Since I last blogged I’ve visited one more place on my list for the A-Z food challenge, I’ve been to a few cocktail events, a lovely re-launch at a local pub and had a sneak look in a Private Members Club in my fair city of Birmingham. And to top that all off I’ve had a lovely break in Edinburgh! So there will be plenty to read once I am up and running again! Please rest assured normal service will resume shortly! !